Prospect Probables: Who’s Pitching This Week? While looking at the 453rd Google Alert item mentioning Collin Balester’s major league debut tomorrow against the Florida Marlins, I noticed that Clayton Kershaw is also scheduled to pitch. This revelation led me to the MLB Schedules page at ESPN.com, where it quickly became apparent that many top pitching prospects will take the mound for their teams in the coming week. And just like that, another weekly feature was born. Call me biased toward the Red Sox and Yankees, but I think the most interesting matchups are slated for next weekend in The Bronx. On Saturday, Boston youngster Justin Masterson goes against New York veteran Mike Mussina; the following day, the Yankees counter with their own prospect, Joba Chamberlain, against Sox elder statesman Tim Wakefield. Bus Leagues correspondent Will G. took a pilgrimage from his home in Brooklyn last week in hopes of photographing the elusive Minotaur, also known as Clayton Kershaw. We are a blog with a minor league focus, but during the first season of a player’s call-up, we definitely like to follow them and see how things turn out. On the DiamondVision. It was the second consecutive walk, to Castillo in the bottom of the third, that precipitated the visit. Pitching coaches hate that. Bottom of the third. Reyes walked, Castillo walked, Wright walked. Reyes is about to score on Beltran’s sac fly to center. Could’ve been a lot worse; Beltran hit it pretty well. 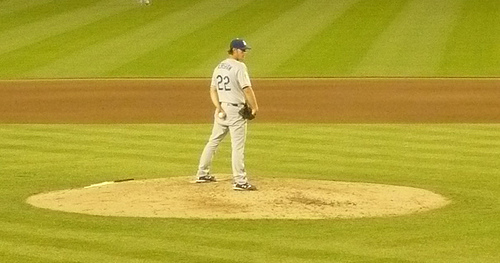 Kershaw in action. Kind of like an ’82 Topps card. Bottom of the fourth. Three straight singles, two fielder’s choices, and a walk, and that was all she wrote. Chan Ho Park would get the final out, no further damage done. There was a small smattering of applause for the Minotaur. Looks like a nice night out at the ballpark. Even though the Minotaur had a rough outing, it must have been nice to actually see how the legend compared to reality. Thanks again for the great pics, Will! 20-year-old Clayton Kershaw made his major league debut for the Los Angeles Dodgers on Sunday, limiting St. Louis to two runs on five hits in six innings. He struck out seven Cardinals and walked just one. In light of that impressive performance by one of baseball’s top prospects, I thought it might be interesting to look at some of the best pitchers of the past twenty or so years and see how they fared in three areas: first batter faced, first game, and first season. For Kershaw, we know two of those pieces – the first batter he faced, Skip Schumaker, struck out, and the pitching line for his debut is above – but only time will tell on number three. Okay, Maddux’s major league debut fascinates me because he didn’t make his first appearance as a pitcher. Instead, he pinch-ran in the 17th inning of a 7-7 game against the Houston Astros – a game that had originally been started by Nolan Ryan and Jamie Moyer (did they supply the pitchers with water from the Fountain of Youth that day?). 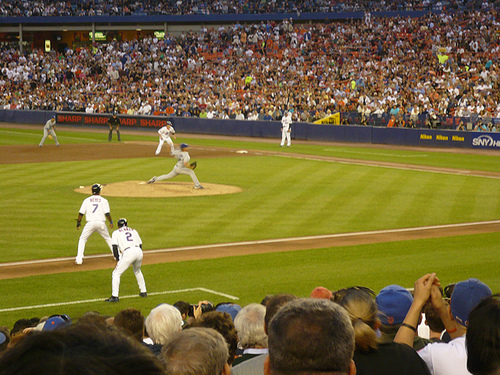 Maddux took the mound for the first time the following inning, gave up a homerun to the second batter he faced, Billy Hatcher, and received the loss. Five days later he made his first start, going the distance against Cincinnati (3 ER, 11 H, 4 K, 3 BB) for the win. He also recorded two hits. Is this common knowledge? Am I the only one who didn’t know about this unusual set of circumstances surrounding Maddux’s first games in The Show? All season, the Los Angeles Dodgers organization has handled Clayton Kershaw, Baseball America’s 7th ranked prospect, with kid gloves, limiting the 20-year-old third-year pro to 43.1 innings in nine starts in order to keep him available for as long as possible. Presumably, that meant keeping him in the minor leagues, at AA Jacksonville, until the Dodgers needed his golden left arm in their rotation. Okay. 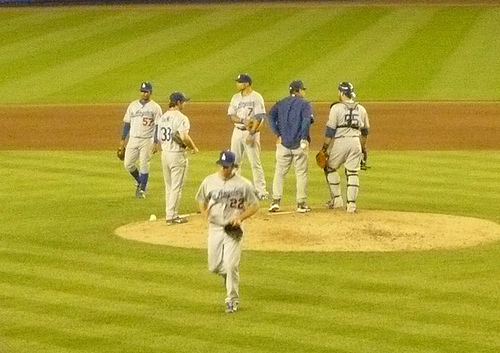 The Dodgers need his golden left arm in their rotation. 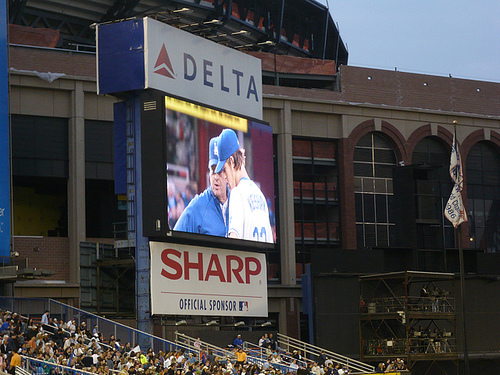 Los Angeles put the call in for Kershaw on Saturday, lining him up to make his major league debut on Sunday against the St. Louis Cardinals at Dodger Stadium. He will become the youngest player in the major leagues this season and the first ever born in 1988. I feel so old. 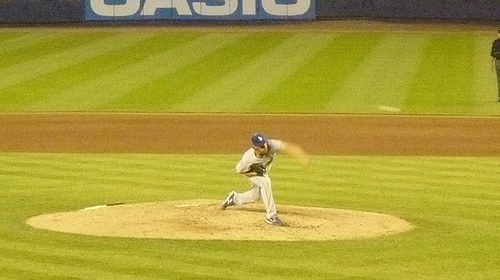 Kershaw pitched well for Jacksonville in 2008, going 0-3 with a 2.28 ERA and 47 strikeouts in the aforementioned 43.1 innings. 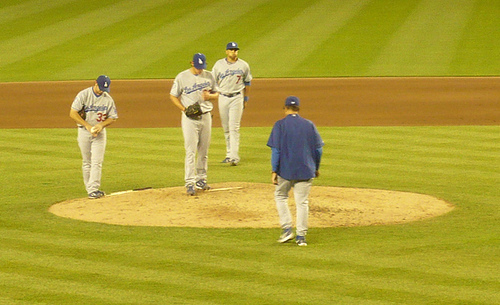 He has thrown only eleven innings since May 7. Esteban Loaiza was DFA and Yhency Brazoban was sent to AAA Las Vegas to make room for Kershaw on the 40 and 25-man rosters, respectively. What the hell does a guy have to do to get called up around here? 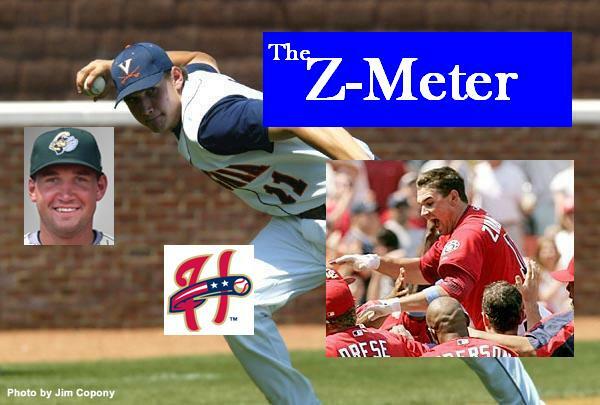 Since last week’s Z-meter, our hero Jay Bruce has improved upon his already stellar triple-A stats, hitting three more homers, raising his averages by double-digits, and putting runs on the board any way he can. The kid is as good as we think he is. Call him up, Cincy! And, not to be lost in our Bruce-worship, Ian Stewart is doing roughly the same thing in Colorado, throwing gasoline on the fire that he’s been stoking since the season began. Play him or Trade him, Rocks! Lars Anderson of the Lancaster Jethawks (Boston) went through a rough ofer stretch early in May, but has rebounded in a big way, hitting .550 over his last four games. Ian Gac is doing the reverse, getting donuts in his last two games, which has not had much effect on his mountain of numbers… yet. UPDATE – Travis Snider is heating up fast. He hit two dingers for 3 RBI and 3 runs since I posted this morning. I’d say he’s adjusting to AA ball pretty well. Get out there and see him, OMDQ! Mets pitching prospect Eric Niesen is out as his ERA climbs skyward. Josh Vitters from Peoria hasn’t picked up any stats for two weeks due to an injured hand, so we’re going to have to let him go for this season unless he starts tearing it up. Matt LaPorta and Mat Gamel from Huntsville are in. Colby Rasmus is hanging by a thread. We’ve been keeping a close eye on the nice stats of Clayton Kershaw, who was on schedule to make his big-league debut despite having a difficult time putting wins on the board. MiLB.com says that promotion to the Dodgers is now on hold, after Kershaw got knocked around by the Mobile BayBears (Diamondbacks). Jay Bruce continues to scorch triple-A, and we’re all just waiting with bated breath to see him in a Reds uni. Elvis Andrus stole three bases and hit .750 in a single game on the 14th, so we’re giving him the red line. Mike Moustakas is slowly clawing his way out of his early doldrums, hitting .500 since May 9th.